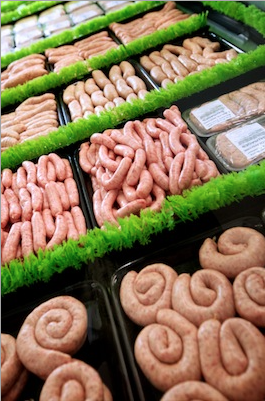 Coming from 25 years experience at a large UK sausage & burger manufacturer I pride myself on recipe creation and product matching, I feel I can create anything you are looking for. The minimum meat content we make is 80%, which is all pork shoulder for our sausages with no fat, rind or jowl and all dry aged rare breed beef for our burgers. Some of our sausage & burger recipes go up to 98% meat. Most of our range is also available in a gluten free option and we also have a non pork range such as a Chicken Kiev Sausage, Lamb Merguez sausage and Beef & Guinness sausage. All products have full traceability and we have the option to use Freedom Foods, Red Tractor/BQAP Outdoor reared best Essex Pork. With a strict food safety policy and HACCP in place I always get full marks from our local EHO.